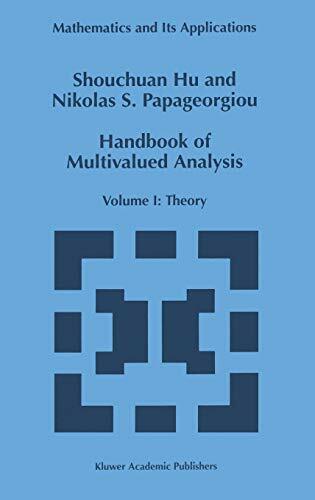 [PDF] Handbook of Multivalued Analysis: Volume I: Theory (Mathematics and Its Applications) | Free eBooks Download - EBOOKEE! Description: We mention that the existing literature on this subject includes the books of J. P. Aubin, J. P. Aubin-A. Cellina, J. P. Aubin-H. Frankowska, C. Castaing-M. Valadier, K. Deimling, M. Kisielewicz and E. Klein-A. Thompson. However, these books either deal with one particular domain of the subject or present primarily the finite dimensional aspects of the theory. In this volume, we have tried very hard to give a much more complete picture of the subject, to include some important new developments that occurred in recent years and a detailed bibliography. Although the presentation of the subject requires some knowledge in various areas of mathematical analysis, we have deliberately made this book more or less self-contained, with the help of an extended appendix in which we have gathered several basic notions and results from topology, measure theory and nonlinear functional analysis. In this volume we present the theory of the subject, while in the second volume we will discuss mainly applications. This volume is divided into eight chapters. The flow of chapters follows more or less the historical development of the subject. We start with the topological theory, followed by the measurability study of multifunctions. Chapter 3 deals with the theory of monotone and accretive operators. The closely related topics of the degree theory and fixed points of multifunctions are presented in Chapters 4 and 5, respectively. No comments for "[PDF] Handbook of Multivalued Analysis: Volume I: Theory (Mathematics and Its Applications)".